How to view PPT or slideshow on iPad? Can I convert my PPT slideshow to flash presentation to be viewed on iPad? 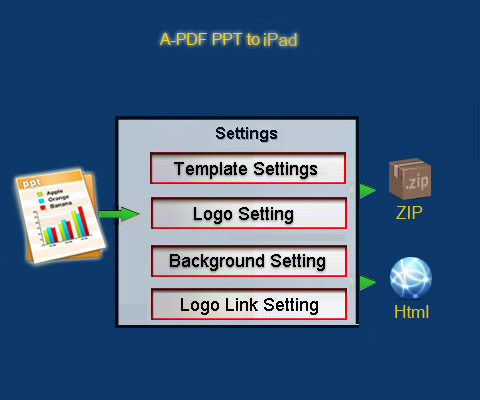 A-PDF PPT to iPad (free download here) can help you publish digital flash presentation to be viewed on iPad. This software is specially designed for iPad use. By converting Microsoft PowerPoint to HTML5 based digital presentation, it enables viewers to get access to the flash animation PPT easily with their iPads. 3. Choose output type (HTML and ZIP) to output the flash presentation. A-PDF PPT to iPad will retain the original slideshow animations which can display on iPad: fade in, wipe, fly in, blinds, box and so on.